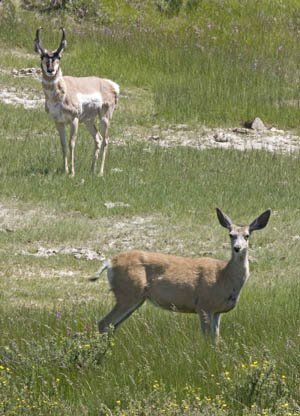 Deer and antelope really can play together. Even occasional readers of these virtual pages are aware that conventional reviews are not their métier. While we are not exactly living in a golden age of the reviewer’s art, I do not consider that the greatest lack that we labor under, nor do I feel it my vocation to fill that breach. What I reckon there is a market for is something for which I’m much better suited: that of the enthusiast — a relatively informed enthusiast, it is to be hoped, but a nonetheless energetic pointer-outer of good stuff. In that vein, I want to point to two events last week that gave me various kinds of hope. First was a night at Zankel Hall in celebration of the 4Oth anniversary of the invaluable Oral History of American Music project at Yale. That phenomenon has been singled out here before, but now we had a deftly-concocted concert that combined the virtues of the recorded, spoken medium with the live means of a concert. When you have more-than-life-sized images of Leonard Bernstein being, yes, an enthusiast for Aaron Copland’s Piano Variations on a sofa beside their beaming composer, then immediately lights go up on a piano and pianist who deliver a vivid performance of the work … well, this is very valuable indeed. Most of the evening went that way, and there were many highlights. Those highlights are detailed in the review already given in the New York Times. The Yale University School of Music, which is home to the OHAM and some of whose students, faculty, and alumni gave the concert, is the only conservatory in the Ivy League. Founded in 1894, it first provided one-year professional finishing for the men who had already concentrated on music in Yale College, and it certainly turned out a good many remarkable musicians who were oriented to both the liberal arts and to the creation or execution of music. The first name to come to mind in that connection was also the first subject of the OHAM, Charles Ives. But, as time went on and as even women were accepted into its courts, the school became a small and select conservatory and is now the only American one besides the Curtis Institute that doesn’t charge fees for instruction. Bard College, which has its own claims to distinction, has decided to make the idea of a liberal-arts grounding paired with musical professionalism its own. It is a courageous thing to found such a program in these times. Oberlin College and its Conservatory have cultivated that ground (as well as having pioneered coeducation) for more than a century and a half, their Conservatory being the oldest continuing one in the country. So starting something new along these lines is a brave thing. The aims and the likelihood that the new Bard College Conservatory of Music will achieve them were, if we’re all lucky, exemplified by the performance of George Perle’s magnificent Concerto No. 1 for Piano and Orchestra by Melvin Chen. Dr. Chen, who also is Associate Director of the Conservatory, is a Ph.D. in chemistry (Harvard), holds two master’s degrees from Juilliard (in piano and in violin), having earlier received a Yale College degree in chemistry and physics. The work, from 1990, was conducted in a remarkably wide-awake fashion by the well-known President of Bard, whose own diversity of gifts and practice need no praise from me. But, lest other virtues of the concert by this already-remarkable orchestra be insufficiently emphasized, I point to another Times review. In that same paper today, there is a feature article on a seemingly unrelated topic that nevertheless comes to mind here. It details the exploits of a journalist who disobeys prime statutes of the field, since he participates in and promotes, rather than objectively “covering,” the social life that surrounds the international world of fashion. Like this blog, he doesn’t claim any responsibility to expose all aspects of what he sees and hears: “I don’t lie,” he says. “I just try to find what was positive and only speak about that.” I know just what he means.